According to Hindu beliefs, a devotee observing a vrat on Kamika Ekadashi is believed to have being blessed more than a person performing ritual baths in all the sacred rivers in India on auspicious days. Also, a devotee completing the Kamika Ekadashi vrat is likely to receive more punya, or blessings, from the Lord than one who has visited all Hindu holy places, such as Kasi, Haridwar, Kedarnath, etc. In this day, Lord Vishnu is worshipped using Tulsi leaves since due to the belief that this will wash away all the sins and evil deeds performed during the entire life. Also lamps are filled with ghee or sesame oil and lit at Sri Krishna temples as part of the offerings. Another major belief for observing this fast is that Kamika Ekadashi is equivalent to reciting all the scriptures dedicated to Lord Vishnu. However, the greatest merit of observing Kamika Ekadashi vrat is achieving Vaikunta Prapthi, that is, attaining salvation in Vishnu Lokam. This indicates that the devotee’s devotion would not be disturbed by Yamadharmaraj, the lord of death, in heaven. “Whoever worships Bhagwan Hari with Tulsi leaves is freed from all implication of sin. Indeed, he lives untouched by sin, as the lotus leaf, although in the water, is untouched by it. Whoever offers Shri Hari a single leaf from a Tulsi tree attains as much merit as one who gives away in charity two hundred grams of gold and eight hundred grams of silver. Purna Prushotam Bhagwan Shri Krishna is more pleased by one who offers Him a single Tulsi leaf than by one who worships Him with pearls, rubies, topaz, diamonds, lapis lazuli, sapphires, gomeda stones, cat’s eye gems, and coral. One who offers Bhagwan Kesav newly grown manjaris (seeds) from the sacred Tulsi plant gets rid of all the sins he has committed during this or any other lifetime. Indeed, mere darsana of Tulsi on Kamika Ekadashi removes all sins, and merely touching her and praying to her removes all kinds of disease. One who waters Tulsi seeds, never fear the Yamaraja. 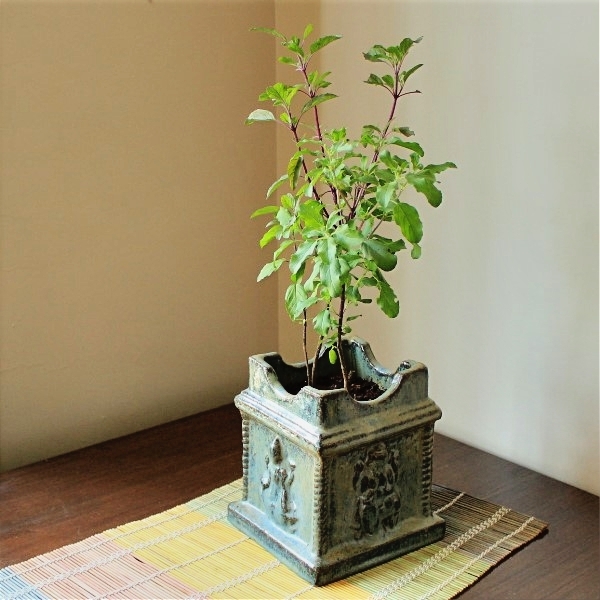 One who plants or transplants Tulsi will eventually reside with Bhagwan Shri Krishna in His own abode. One should therefore daily offer one’s full obeisances to Tulsimata, who awards liberation in devotional service. Even Citragupt, Yamaraj’s secretary, cannot calculate the merit obtained by one who offers Tulsi-mata a perpetually burning ghee lamp. So dear is this sacred Ekadashi to Purna Prushotam Bhagwan that all the forefathers of one who offers a bright ghee lamp to Bhagwan Shri Krishna on this day ascend to the heavenly planets and drink nectar there. Whoever offers either a ghee- or sesame-oil lamp to Shri Krishna on this day is freed from all his sins and enters the abode of Surya, (the sun), with a body as bright as ten million lamps”. “Yudhisthir these were the words Brahma spoke to Narad Muni concerning the incalculable glories of Kamika Ekadashi, which removes all sins. This sacred day nullifies even the sin of killing a Brahmin or of killing an unborn child in the womb, and it promotes one to the spiritual world by making one supremely meritorious Whoever hears these glories of Kamika Ekadashi with faith becomes free of all sins and returns home, back to Vishnu-lok. (the planet of Vishnu)”.